Minot's Industrial Park is BNSF Site Certified! Minot: Gateway to the Bakken! Click here for more. Click here to read about North Dakota's leading industry! ND Ranks #1 and #2 in 17 Different Ag Commodities! Did you know ND exports ag products to 83 countries across the globe? Known for the energy-rich Bakken region and producing 15 top ranking agriculture commodities, Minot offers endless opportunities for your business with competitive incentives, reliable infrastructure, hardworking Midwestern workforce, and a vibrant community. Expand your business to Minot, North Dakota where our Magic City powers the world through agriculture, provides for the world through energy, and protects the world through the Minot Air Force Base. 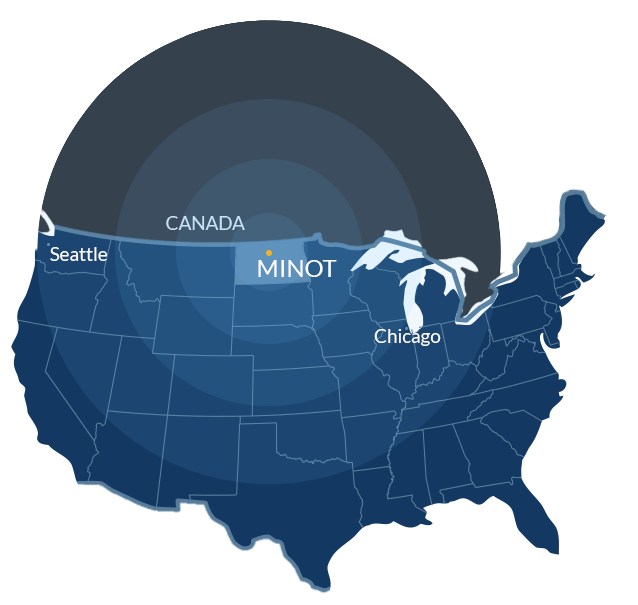 Home to the largest distribution hub between Seattle and Chicago, the Industrial Park of Minot features rail and non-rail served property; city services including water, sewer, gas, & electric; and opportunity for your business to access the world. Minot’s strategic location for value-added agriculture businesses offers direct access to 2 Class 1 railroads, 3 U.S. Highways, heavy industrial zoning, and many other unique advantages at the Industrial Park of Minot. North Dakota consistently ranks #1 and #2 for 17 different agriculture commodities with Minot being a hub of production. Between large-scale petroleum activities, NGL feedstock opportunities and wind power, Minot is an advantageous location for energy businesses. Known as the gateway to the Bakken, Minot is home to worldwide petroleum businesses such as Hess, Enbridge, Baker Hughes and many more. Come visit our Magic City in the heart of the Bakken! . Looking for more data about the Minot region? As the No. 1 Best Run State in the Nation for the 3rd year in a row (24/7 Wall Street 2014), there’s no better state to invest in! Click here for the latest up-to-date information you need to expand your business to Minot, North Dakota. The Unmanned Aerial Systems (UAS) industry is an emerging industry that has experienced tremendous growth and demand over the last few years, North Dakota is quickly becoming known as the drone state. With a rural setting and wide open skies, Minot is a prime location for UAS operations. Between military and commercial uses, the opportunities are unlimited for UAS businesses in the Minot area. Click here to read all the advantages Minot has to offer the UAS industry. Between large-scale petroleum activities, NGL feedstock opportunities and wind power, Minot is an advantageous location for energy businesses. Known as the gateway to the Bakken, Minot is home to worldwide petroleum businesses such as Hess, Enbridge, Baker Hughes and many more. Come visit our Magic City in the heart of the Bakken! Welcome to Minot, North Dakota! In the heart of North America, Minot's rich history in economic development is evident through the many companies the Minot Area Development Corporation (MADC) has attracted and supported in the area. These companies have enjoyed greater profitability and productivity - and so can you! MADC focuses on building and supporting a resilient, sustainable, and diversified economy to ensure Minot is the right location for businesses and families. The most accessible airspace in the U.S. Proudly serving Minot as well as the surrounding area.